Part of the Giza Necropolis – Egypt’s most-visited tourist attraction – are the three large Pyramids of Giza. The largest is the Great Pyramid of Giza – also known as the Pyramid of Khufu or the Pyramid of Cheops. A royal tomb standing nearly 140m high, it was built from more than two million blocks of limestone, most likely mined from nearby quarries. This reflects the influence of the Fourth Dynasty in Ancient Egypt, which reigned more than 4,000 years ago. The pyramids’ original smooth limestone exteriors have long since weathered away, but the chance to explore the site is a chance to reconnect with the past. Also located in Giza, the 73m tall Great Sphinx is a monument to the Egyptians ancient myths and religion but its origins remain mysterious. Facing due east and carved into a solid block of limestone in the Giza plateau, it depicts a human head on the body of a lion. The head may be that of the pharaoh Khafre, who also had built the second-largest pyramid in Giza. Another theory is that was built to honour the ancient Egyptian sun god, Ra. Its name literally translates to ‘The Father of Dread,’ which perhaps says it all. A complex of temples not far from Luxor, Karnak is a fantastic site for exploration, boasting a diverse mix of ruins, columns and obelisks. The former capital of ancient Egypt, Karnak – then Thebes – was constructed over centuries and retains its impressive spectacle. Visit Karnak if you want a comprehensive history lesson or, are hoping to spot a familiar backdrop from one of the many Hollywood movies that have used it as an otherworldly location. The resident of Egypt’s most famous pharaoh’s tomb – the only one on record to be discovered almost fully preserved and not raided by thieves – remains in his final resting place, but his treasures are on display at the Egyptian Museum. 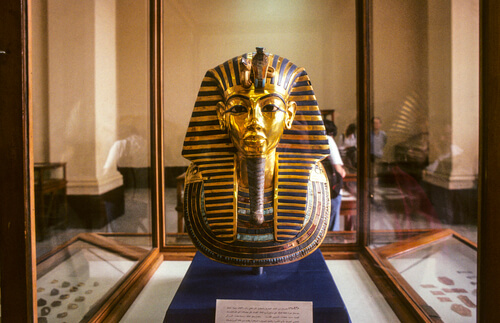 The most stunning artifact uncovered remains his gold and blue funerary mask but there is plenty more to explore. Not least are the remnants of the life of a pharaoh who was the son of siblings, began his reign while still a child and whose death marked the end of one of ancient Egypt’s noble family lines. Two gigantic structures carved from mountainside rock, the Abu Simbel temples take their place among Egypt’s most notable landmarks. The temples have an imposing authority that reflects the leader who built them: Ramesses the Great, a 19th dynasty monarch who reigned for seven decades until 1213 BC. Four seated pharaohs, carved onto the outside wall of the larger temple, greet visitors before they journey inside to marvel at a remarkable array of inscriptions, painting and statues within both temples. Equally impressive was the project undertaken in the 1960s to relocate both structures from their original site and avoid flooding. All ancient Egyptian temples are unique, but the Kom Ombo Temple is the only one that honours two gods with a symmetrical design. Haroeris, the falcon god, and Sobek, the crocodile god, were both enduring figures in Egyptian mythology and led to the construction of this structure’s two sets of gateways and chapels. Built during the 1st century BC, it is a relatively modern structure that survived ancient Egypt’s final, 19th dynasty by honouring centuries of tradition, culture and religion. Located near the former capital of ancient Egypt, Luxor is a beautiful city with plenty of modern tourist attractions. At its centre, its ancient temple has stood the test of time as its most recognisable landmark. Built from sandstone during the 2nd century BC, it features a series of open courtyards and impressive statues of Ramesses the Great and other Egyptian icons. Open until late, it’s a treat to watch the sun set over its columns but not the civilisation that it preserves. Possibly the largest number of pharaohs you’ll find commemorated in one place – which for Egypt is a truly impressive claim – is in the Valley of the Kings. Constructed over the course of nearly 500 years the Valley is a series of tombs each dedicated to ancient Egyptian leaders. The site was maintained until the 11th century BC and has been excavated and maintained for more than 200 years in the modern era. 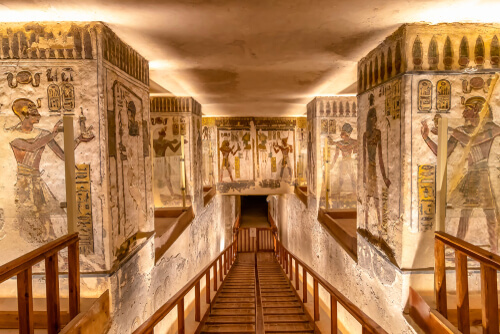 Among more than 60 tombs and numerous chambers are many startling designs and opulent interiors which, at the time, were filled with valuables. The wall markings alone provide a fascinating lesson in life and death in Ancient Egypt. One for true explorers and ancient history aficionados, Philae is an island located in a reservoir, with much of what surrounded it at one point now submerged underwater. Surviving today is its iconic temple complex with its largest structure honouring Isis, the ancient Egyptian goddess whose worshippers spread into Italy, Greece and Hungary. The Temple of Isis was part of another relocation project to avoid further flooding and covers about a quarter of the island. It also contains other fascinating remnants of what was a strategic outpost for the Egyptian empire. While the monuments of ancient Egypt are important for remembering what was built, equally fascinating is the river running through its history. No civilisation can flourish without water to sustain itself, something the Nile provided by creating a route for trade and a source of food. Journeying along the river is not only an opportunity to see the sights – many are not far from its banks – but to tap into the consciousness of ancient Egypt. The rising of its tide was attributed to the tears of Isis, one of Egypt’s many myths and customs.